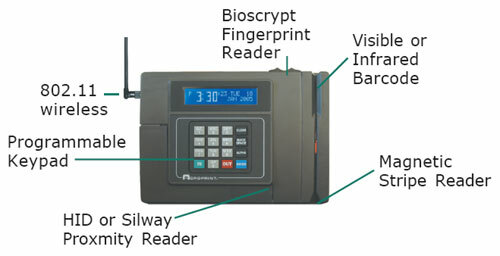 The DC7000 Data Collection Terminal is a powerful processor and offers multiple reader options including advanced finger scan biometrics, barcode, magstripe and proximity (HID and other 125 kHz RFID compatible standards). Communications options include encryption-secured Ethernet, WiFi, modem and serial. With built-in flash memory of up to 2 MB, the DC7000 is engineered to grow and adapt to your evolving needs. The DC7000 is a flexible terminal platform that can be customized to individual specifications.